Storypath » Say Hello, Sophie! 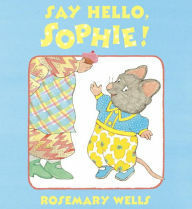 Summary: Sophie, a toddler mouse, can’t seem to say words like, “Hello,” “ Thank you,” and ,”Good-by.” Her mother always says, “What do we say, Sophie?” when Mrs. Belinsky gives her a cookie or the park ranger gives her a badge. “Hello ”gets stuck in her throat or “Thank you” shrinks to the size of a pea. Sophie’s parents make her practice at home with her little sister, Jane, or with the statue of George Washington in the park. When she meets a real person nothing comes out until one day Granny is babysitting Sophie and Jane. They decide to go get ice cream but just as they get to the store, Grannie has a toothache. “Brave girl, take charge,” she says to Sophie. And Sophie does, using all the right words. Literary elements at work in the story: The inside cover is filled with bright yellow flowers and yellow is a dominant color throughout the book, suggesting that once again Rosemary Wells is making light, cheerful work of a typical toddler’s problem. Theological Conversation Partners: Good manners are, in essence, loving our neighbors as ourselves, doing to others as we wish them to do to us. Acknowledging another person when you meet or separate, requesting and receiving help with gratitude are polite actions; they are also a recognition that you are relating to a child of God. A toddler won’t think this but the adult who is doing the modeling and instructing will. Children who worship in congregations that ‘pass the peace’ may have a special challenge; they will also have a special advantage. Practicing may help; observing and imitating an adult is essential. Granny’s method of relying on a child without any adult interference is not, I think, guaranteed to produce such good results without the practice and the instruction that lie behind it. The children fortunate enough to develop relationships with a variety of ages, children who have adults who listen to them, children who feel they belong (all should be conditions in the church) will master this problem as they grow. Reading and talking about this book could also help. There are several words we use to greet people. What are some of them? Do you find it hard to say “hello” to someone you don’t know very well? Why? What did Granny do or say that helped Sophie speak to the person serving ice cream? Have you ever been in a class or on a playground where no one spoke to you? How did it make you feel? How do you make a new friend? Does it involve words? Jesus sends out his disciples to tell the good news and instructs them, “As you enter the house, greet it.”(Matt. 10:12) Their greeting would probably have been “Peace” or “Shalom.” In some churches members of the congregations greet each other this way. Say Hello, Sophie! by Storypath is licensed under a Creative Commons Attribution-NonCommercial 4.0 International License.